The English Curriculum is organised into three interrelated strands. Together, these strands focus on developing our students’ knowledge, understanding and skills in listening, reading, viewing, speaking and listening. 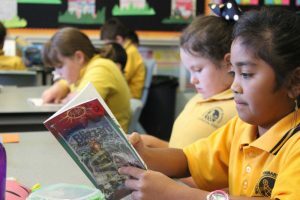 A consistent approach to literacy learning provides direction in planning for improvement. Literature – understanding, appreciating, responding to, analysing and creating literature. Our teachers design learning experiences which support students in developing functional and critical literacy skills. Teachers are supported by a Literacy Leader, who works with teachers one day per week.